Paisley & Polka Dot Threads: My first project is complete! 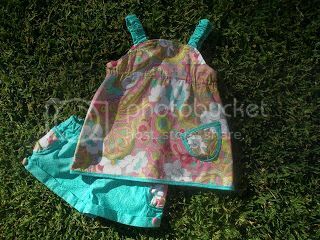 Mid last year I was given a gorgeous pattern for a child's outfit from Make it Perfect. 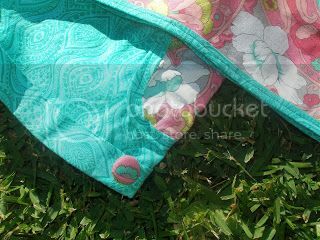 Toni Cowards' site and blog have got to be one of my favourite sewing sites - her fabric choices are always spot on and her patterns are beautiful. (I should say that I don't actually know Toni, just check her blog religiously!). She has a great range of clothes, and her new book (my Christmas present) has a few items that went straight on the 'To Do' list for 2011. I was actually a little nervous to start on her Bloom tunic and shorts set; I wasn't sure my sewing skills would be up to the task. But this year I jumped in, and I just love the result! I'm a sewing novice, so I won't pretend that there weren't mistakes. I cut the short pieces out three times before I got it right, and the binding on the tunic is a bit bulky, BUT I LOVE IT!!!! Emma looks gorgeous in bright colours, and I love anything even a little retro, so I'm completely delighted with the result. There are so many great little details to the set - covered buttons, turned up cuffs - and with a little time and patience I could manage it with only a few stressful moments. Emma wore the outfit for a day out in Manly and I can't tell you how many people looked twice and smiled. (This may also have had something to do with the fact that Emma was walking through the Manly Corso singing, dancing, and every so often screaming 'Ta Da!!' at the top of her lungs). 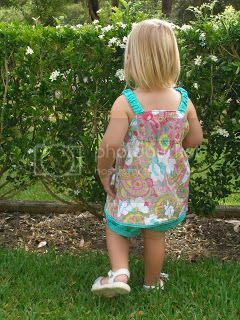 Regardless, seeing my little girl in something so cute, and that I had made, was wonderful! !